Suzuki Motor Corporation’s Indian subsidiary Maruti Udyog Limited launched the SX4 Sedan in India on 7 May. 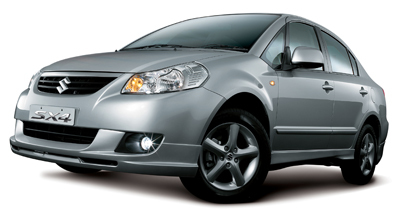 The SX4 Sedan is a newly developed saloon version of Suzuki’s third world strategic car, the SX4. It’s powered by a 1.6-litre engine and combines practical exterior dimensions with the level of comfort expected of a good-quality saloon. Suzuki launched the SX4 in Europe in March 2006, in Japan in July 2006, and in North America in September 2006. We launched the SX4 Sedan in China in January 2007. Maruti is producing the SX4 Sedan at its new plant in Manesar, Haryana, and is marketing it in India as the highest-grade model in its vehicle lineup. Amid a growing market for saloons and other passenger cars in India, Maruti plans to expand the combined annual production capacity of its Manesar plant and Gurgaon plant to 960,000 units by fiscal 2009 in line with targeted sales expansion.